Nick: Oh, Twitter. Speaking of which, I got followed back by Dana Carvey. Dave: Nice. San Carlos’ proudest son. Nick: I was super excited, because it was Dana Carvey. Then I checked. He’s following 26,000 people. I think him or his assistant literally checks to see if you have more than 3 followers who aren’t bots and follows you back. Which, dude, how do I get paid to do that? Nick: This week made me wonder if Kevin Sullivan would have used Twitter if it were around when he was working. Nick: Or was he too “old school” to bother with the Tweeter? His entire career seems like an argument for traditionalism in wrestling. And I don’t mean in the “he’s a great example of traditionalism”. I mean, he kind of insisted upon it. Dave: His era was so different it’s hard to even process that question. I don’t think he would have used twitter because Sullivan was very visual. He wasn’t just a great talker, he was a talker who used an over-the-top visual aesthetic to get his guys over too. Nick: Which was good, because Rotunda and Steiner weren’t the best talkers. Dave: No, not at all. This week really made me reflect on why neither of them got over as big as The Varsity Club was designed to get them, and it was definitely their promos. Steiner was so bad that they had to embrace it, make him a near-Eugene-level lovable dumb guy, and then eventually give him Gilbert to work with. Nick: It felt weird finding out their run was so short, but looking at the broader picture, that seems to be par for the non-WWE course. Based on the average length for factions at the time, they were a ticking time bomb, right? Dave: Well, yeah. Factions are basically made to eventually split up (minus the Four Horsemen), and Steiner was the most likely candidate to become a strong babyface, which (as I alluded to in Essential Viewing), he did. He just didn’t become a main event singles baby face. Nick: Was Rick the most successful member post club? Dave: Well, it depends on how you look at things. 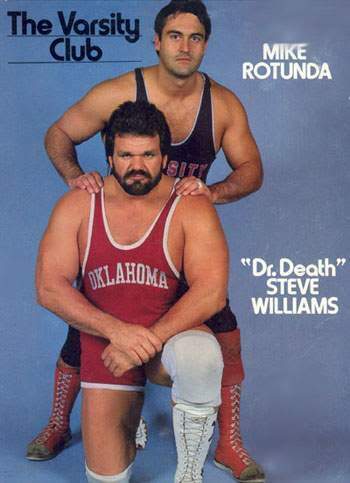 Steve Williams went on to be crazy successful in Japan, but aside from his run at the top of the failed UWF and his failures during the Monday Night War (being knocked out by Bart Gun, being a bodyguard for Oklahoma, etc. ), he really wasn’t heard from again as a serious star in the U.S.
Nick: There’s a reason I ask that question. Before this week, I vaguely knew about them because we are friends, but I was not particularly familiar with the Varsity Club, to be honest. I struggled to do the Juice Make Sugar Recommends…, which is why I did four and walked away with my head hung level. Dave: A theme that emerged all week to me was that the official WWE version of history has basically blotted out this point in JCP/WCW history (minus the Horsemen and the emergence of Sting), so it’s hard to draw conclusions. Even for Essential Viewing. There were so, so few clips on YouTube, and while I love dailymotion, it makes me sad that the videos won’t embed, so my choices were limited. Nick: Yeah, exactly. And that’s a huge issue. One that’s it’s difficult to figure out what to do with — and not just from a technical standpoint. It’s problematic for the entire industry’s history. 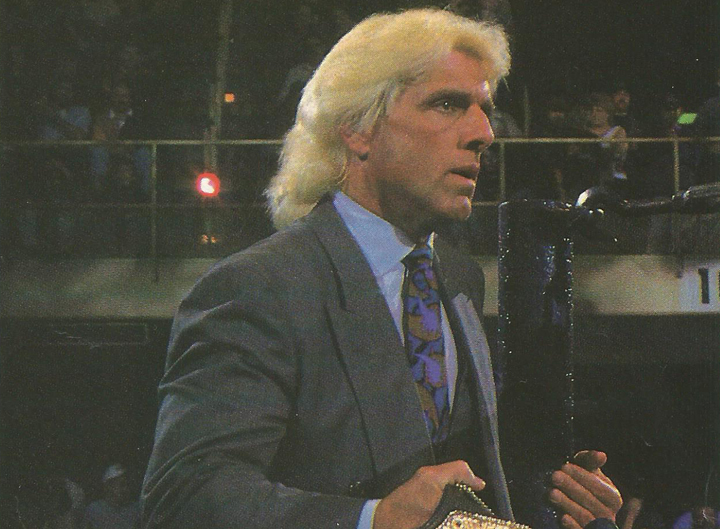 Dave: It’s scary proof that the WWE version of history is slowly being codified as the history of wrestling. Nick: Yeah. And it’s not just that there is one major historical record, for the most part, but that they control the story. When they say “Then, Now, Forever”, they aren’t kidding. Dave: You can’t tell where the real history ends and the work begins. See: WrestleMania 3. Nick: Eff you, Dave. Andre the Giant was 7’9” and 600 lbs. Poor guy died almost immediately after from embarrassment. Let him rest in peace. Dave: 100, 931,038, 201 fans crammed into the Pontiac Silverdome to see it. Nick: I feel like you made up that number. Seems oddly specific. Dave: Their version of history (especially pre-Monday Night War) is dubious at best. Dave: Lie: The AWA died when Hulk Hogan left. Lie: The wrestling audience grew with national expansion. Lie: WCCW only had the Freebirds vs. The Von Erichs. Nick: That sounds like a fantastic column idea: Lies the WWE told us. Dave: That’s scary open-ended. It could go on for days. Nick: We’ll have to make it a series. I can then write about my favorite one: Demolition was the best tag team of the late 80’s. Though, I think even that has been revised to include the “Legion of Doom”. And the WWE never mentioning that The Club beat L.O.D. — when they had their Christian name Road Warriors — tells you exactly how much they hated JCP. Dave: Demolition’s treatment shows how amorphous their history is. “Yes, we admit that Demolition were a rip-off of the Road Warriors (truth), but we contend they were equally over in their own way (lie) and they were on more moneymaking shows (lie. )” And yeah, it was very personal between WWF, Dusty, and the Crocketts at that point. Nick: Virgil, for instance. Outside of the manifestation of “winners write history books”, what’s most amazing to me is that Scott and Rick didn’t come in together. I did not know that. Dave: Yeah, Rick was around in JCP/WCW for almost three years. Nick: I can’t fathom a world where they aren’t connected, and that’s partially mostly the WWE’s doing. Nick: So, given the way history works, is it possible to rank or integrate The Club into the hierarchy of teams of their era? And if so, where would you place them? Dave: While it’s approaching sacrilege to some, I would rank them ahead of The Heenan Family because they were so much realer as characters and a “team.” They weren’t just a bunch of cartoon heels led by a cartoon weasel. Dave: But Sullivan dropped the Satanist gimmick, and at that point people outside of the Southeast had basically no knowledge of it. So it worked for the time. Nick: So, a reformed Satanist and a bunch of jocks. Sounds like a sitcom! Dave: Well, what is wrestling if not a humorless sitcom? Nick: Wait, wrestling is Two and a Half Men?